I was asked to join the Nuclear Family shortly after my departure from The Breakups. My good friend Thomas Becker had been playing with Justin Roelofs and Tyler French for about a year and they had just released a full-length CD, Got Ripped Off, on Manic, a local label that also put out records for Tenderloin and Stick. They had played some shows, mainly in Kansas, but were not well known. 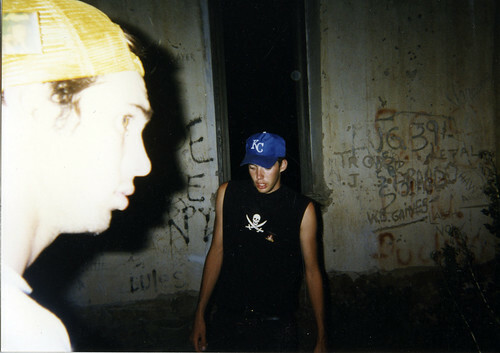 In August of 1996 Thomas moved to Oakland for college and I took his place as drummer for the band. We practiced out of Tyler and Justin’s parents’ homes and we didn’t spend much time together writing songs, as a whole record was already in the bag. After a few practices we were joined by Trashfis (from 110 Volts) who played second guitar and sang backups. The majority of my memories with these guys center around harassing strangers and practical jokes more so than playing music. I have a feeling there are still people who remember being fucked with at Rosanna Square or at the numerous suburban home and field parties we crashed. One thing that struck me as odd at the time was that Justin was super Christian, as in abortion clinic protesting Christian, but he was the most sarcastic and hypercritical of us all, which is hilarious to me now given the shirtless neo-shaman of Lawrence, Kansas he has become. Justin had an incredible ability to comprehend and imitate anything you put in front of him and he used this ability to write really catchy pop songs. Playing in this band was a welcome challenge for me and it probably helped that we were all the same age (as opposed to being five years younger than the next youngest guy in The Breakups). The only thing we took seriously was playing music and we had a blast playing together. Near the end of our run in 1996 we were asked to tour with a major label band by the name of Goldfinger. 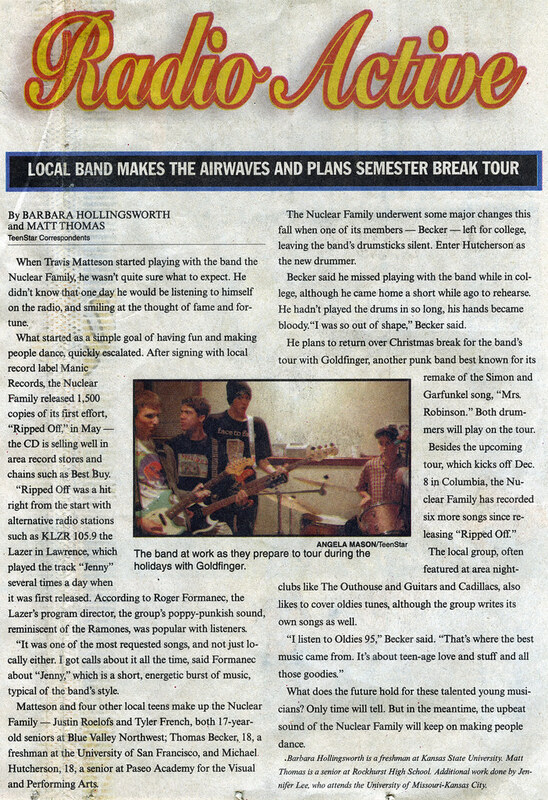 They had just released their first record and we ended up playing some midwest dates with them and another band, Nerf Herder. They were all super nice guys. John Feldman from Goldfinger went on to become a big time producer in LA (The Used, Hilary Duff, Story of the Year) and is also an outspoken animals rights activist. I’ll never forget the sold-out show at Mississippi Nights in St. Louis—I’ve never since played a show that huge or been treated so well by the staff of club. I’ve only found two photos from that tour, one of Josh Berwanger (who roadied for us) and Tyler and another of Trashfis and Tyler. I regret never recording anything with The Nuclear Family. After a few months of playing together we did work out some new songs, which I thought were rad, but when the time came to record them Thomas flew back to KC for the recording date and laid down the drum tracks instead. He was always a much better musician than myself, so I guess it made sense he was on the record and not me. 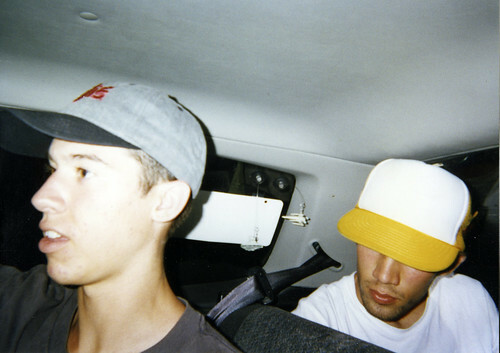 The dynamic between Justin and Tyler, who were childhood friends, really soured after the Goldfinger tour and practices became less and less frequent. Tyler was way into his girlfriend at the time and Justin was investing all his energy into songwriting, which was sounding a lot more like The Rentals and The Cars rather than Screeching Weasel and Green Day. His 4-track demos sounded good to me, something I could definitely get into playing, but Tyler wasn’t feeling them. I don’t remember an official decision to dissolve The Nuclear Family, but once Justin, Josh Berwanger (from John C. Holmes Band) and I started working on these new tunes we all understood it was going to be a completely different band.